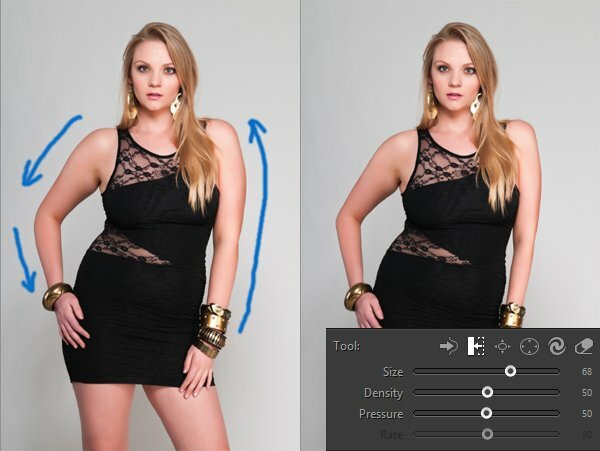 This tutorial will show you how to make a person on the picture look thinner by using Liquify tools in PT Photo Editor. 1. Start off with the image that you are going to be working on to trim off a few pounds. Zoom in to the area that you are going to work on. 2. Choose the Liquify tool in the tool stripe. The Liquify toolkit lets you push, pull, rotate, pucker, and bloat any area of an image. The distortions you create can be subtle or drastic, which makes the Liquify command a powerful tool for retouching images. In this example, we will mainly use Forward Warp and Push Left tools to transform the girl’s body. 3. First, use the Push Left tool to slim down arms. 4. Thin thighs with the Forward Warp tool . 5. Reshape body and trim off the flab.